Paul Anderson has gathered together an all-star line up to join him in a concert raising funds for the Anchor Unit at Aberdeen Royal Infirmary. Music has been a therapy to top Scots fiddle maestro Paul Anderson in his fight against cancer – and now his is celebrity friends are tuning up to support him on his road to recovery by taking part in an all-star musical variety show. Hollywood actor Kevin McKidd, filmmaker Richard Jobson and River City actor Iain Robertson are taking to the stage for a glittering musical variety night, taking place at Aberdeen’s Music Hall on Friday, May 3, that will raise funds for a leading cancer treatment centre that has supported Scots fiddler Paul Anderson as he battles the disease. Paul Anderson and his wife Shona Donaldson with Hollywood actor Kevin McKidd. 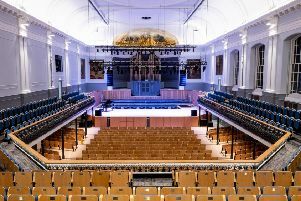 The stars of stage and screen will join Capercaillie’s Karen Matheson and Donald Shaw, Bruce McGregor from Blazin’ Fiddles and Scots singer and Paul’s wife, Bothy Ballad champion of champions Shona Donaldson, in performing at the concert. Paul has been receiving cancer treatment after being diagnosed with high grade Non-Hodgkin Lymphoma in September last year and asked his famous friends to unite in their common love of music to raise funds for Friends of the Anchor Unit at Aberdeen Royal Infirmary. While the main aim is to raise funds as a thank you to the unit where Paul has been having his treatment, the planning of the event has proved a welcome distraction for the musician. As someone who has rarely had a day off due to illness in his life, the diagnosis was a shock, but the cancer has been caught early and Paul has been told the prognosis is good. Paul said: “When I was diagnosed last September I had to cancel some of my plans and it really bothered me letting people down, although everyone was brilliant, and really supportive. “So, after that I said I wanted to carry on regardless and that’s what I’ve done. “I could not have been happier with the treatment and the attitudes of staff at the Anchor unit, so decided to organise a concert as a way of thanking them. “What I didn’t want to do was dwell on being ill. I have felt tired, and sometimes the last thing I have felt like doing is going and playing a concert, but once I start it gives me a noticeable lift, both in spirits and energy. The music certainly seems to help invigorate me. Paul has had musical collaborations with all the stars on his bill, and fixed the concert date to tie with a rare return to Scotland by Elgin-born actor Kevin McKidd, star of Trainspotting and Grey’s Anatomy. The pair worked together on Kevin’s Speyside Sessions album, a collection of Scottish folk music, a few years back. Paul worked alongside Skids frontman turned film maker Richard Jobson on a score for a Scottish film. Having raised £1000 for Macmillan Cancer Relief from a head shave to get in first before losing his hair as a result of the chemotherapy, he’s keen to turn his focus to showing his support of the Anchor Unit and the work it does to support cancer patients across the North and North-east of Scotland. The evening of traditional Scottish music will be hosted by Fiona Kennedy and will include a pipe band performance. Paul will showcase some music from his newly released album, Beauties of the North, a collection of airs and laments of Scotland. Paul lives in Tarland in Aberdeenshire, with his wife Shona and two children, and is regarded as one of the finest fiddlers of his generation. He’s something of a Scottish icon, with a commissioned study of him hanging in Scotland’s National Portrait Gallery. He has performed to many famous people, like at a private reception at Fyvie Castle to celebrate Prince Charles’ 60th birthday and he played at Edinburgh Castle for Sir Sean Connery’s 80th birthday. During his competitive years, Paul won most of the traditional fiddle championships in Scotland and was winner of the Glenfiddich Scottish fiddle championship in 1995. A reputed composer, he has written over 300 pieces in the Scots style. His music has provided the theme tune for film and TV shows and he’s been a regular on TV and radio programmes too. Last year the virtuoso was named the first ambassador of the North Atlantic Fiddle Convention (NAFCo), an international celebration of the instrument.